Richard Felton Outcault (1863-1928; published as R.F.) is a major figure in the history of American cartooning as well as a commerical innovator, specifically in the development of licensing of visual properties. 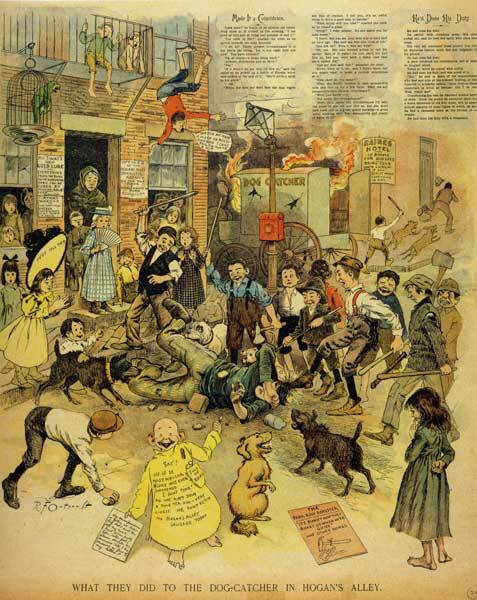 Outcault created the extravagantly illustrated feature Hogan’s Alley in 1895 for the New York World. The lead character of the feature was “the Yellow Kid,” otherwise known as Mickey Dugan, an Irish tenement dweller. (There is much to say about the feature itself, but space will not permit today.) Outcault was hired away from Joseph Pulitzer’s World to join Hearst’s New York Journal, where the feature was retitled The Yellow Kid (1896-1898). The Journal's version was drawn by George Luks, a future member of the Ashcan School and confederate of William Glackens, who also worked for the papers and would go on to prominence as a member of The Eight. For his part, Outcault went on to produce Buster Brown (1902-1910). Having been burned by copyright restrictions from realizing licensing income from the Kid, Outcault copyrighted Buster Brown before the feature ever appeared in print, and went on to create licensing deals for his character in a wide variety of product categories. The one we remember today is Buster Brown shoes (manufactured by the Brown Shoe Company, which was owned by a real and not fictional Brown). The Yellow Kid is considered an important starting point for the development of American comics, though its previously attributed status as the first real comic strip has been disputed by recent scholarship. The Yellow Kid also gave his name to yellow journalism. All of which is background to the following observation. I have spent the last several days in Washington D.C. doing research on an exhibition several years in the future. Spent Friday in the Library of Congress looking at Civil War drawings (and a few of William Glackens' very striking Spanish American War drawings from on location in Cuba). Subsequently I went with a colleague to the Newseum, a pulsating temple of infotainment which did not much satisfy this visitor. I documented a thing or two with my iPhone. On the fifth level there is an overwhelming accretion and arrangment of historical items and placards which aspire to tell the history of the news business. While the objects are interesting, they are so numerous and tacked-together that an orderly absorption of their content does not seem possible. The Yellow Kid makes several appearances among this mish-mash. But scandalously, R.F. Outcault's is never mentioned! Nor, for that matter, is George Luks! Why? Mind you that the heroic reporters and photographers are credited. So if the articles don't write themselves, and the photographs don't orchestrate their own existence, why suggest illustrations are not made by actual persons with names and histories? From this we learn yet again that ignorance of functional and commercial traditions of image-making are absolutely standard, even among well-educated people. Art is made by individuals; illustrations and cartoons are made by "the culture." Galls the hell out of me. More reason to continue to bang away on the limitations of art history, and to advocate for alternative, parallel histories of visual culture. R.F. Outcault, "What they did to the Dogcatcher in Hogan's Alley," New York World, September 20, 1896. Published shortly before Hearst hired him away from Pulitzer in October of that year.